The curtain came down on the 2015 season at Central Park on Friday night as the Eastbourne Eagles took the first ever Kent County Fours Championship. 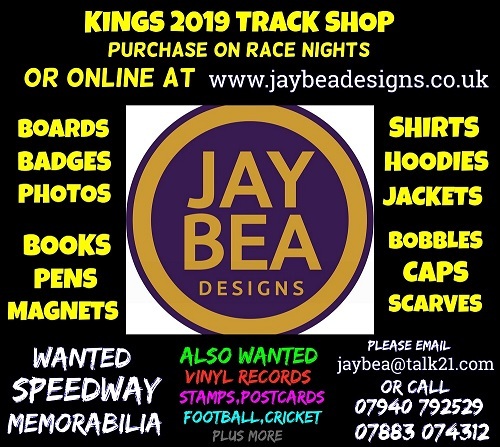 A night that had started in celebration with grass track champion James Shanes, and National League Pairs Champions Danny Ayres and Ben Morley receiving an ovation from the crowd ended in disappointment for the Kings who finished as runners up behind the consistent Eagles. Things could have been different for the home fans had Jack Thomas’s Kent debut not lasted as long as it took his engine to explode on the line in Heat 1. Left without machinery the 16 year old who’d done so much to impress in the previous weeks Silver Ski Championships was forced to withdraw from the meeting leaving the Kings without a representative in three heats. That was enough to give the advantage to the Eagles who were anchored by skipper Marc Owen, and the fit again Bradley Wilson-Dean. Owen was the only rider to lower the colours of Kings Danny Ayres who proved the pick of the home riders. The 29 year old once again demonstrating his meteoric two year rise from training school to National League Riders Championship silver medalist holding off a charging Wilson-Dean in Heat 6. Had home skipper Ben Morley started the meeting the way he finished it the evening could well have taken a different course.. The National League Riders Champion trailed in a disappointing third behind Owen and Mildenhall’s Tom Bacon in his opening ride. It wasn’t until Heat 12 that the Kings skipper really got going outpacing Fen Tigers Connor Mountain for his first win of the night. After an initial win James Shanes found the going tough on an often greasy surface, having finished third in his second outing he couldn’t find the drive to get round the fast starting Wilson-Dean in Heat 11. Despite being a man down the Kings were within one point of the Eagles at the half way stage before Richard Andrews victory in Heat 9 stretched the advantage back to four points with the Kings and the Fen Tigers level on 13. It was the home side who posed the greatest threat to the South coast dominance in the second half of the meeting, Ayres win over Connor Mountain as Eastbourne’s Andrews was forced to retire once again narrowed the lead to a single point with three races left. With no rider in the next heat though the Kings could only stand and watch as skipper owner re-established the Eagles advantage. That left James Shanes needing to win Heat 15 and hope that Eastbourne’s Georgie Wood finished out of the points to force a last heat decider. Wood though kept a calm head to claim the points the Eagles needed for victory finishing behind the impressive Bacon. The Kings faithful though still had some reason to cheer as Ben Morley outpaced Wilson-Dean in the fastest time of the night in Central Park’s final race of the season.